Literary Corner: "ee cummings: Complete Poems, 1904-1962"
The fourth book in our series examines the collected works of ee cummings. This mammoth volume of work is 1,216 pages of literary and poetic genius. The book contains all of the poetry that Cummings (I shall heretofore capitalize his name, to make things easier) ever wrote. Known for his curious approach to the written (and spoken) word, Complete Poems 1904-1962 is a must-have for any fan of poetry. Edward Estlin “EE” Cummings was born to be a poet. In his youth he would write daily, and received encouragement from both of his parents. It is from this fertile soil that up sprang one of, if not the most, unique voices in the new American poetic movement. His father, a professor at Harvard, and his mother, a homemaker, always supported EE in his creative endeavors. He grew up and eventually became an ambulance driver in World War One. Cummings never expressed a desire to fight, nor did he ever express any animus towards the Germans. He was eventually thrown into a detention camp, suspected by the French of espionage. After being released and eventually drafted into the US Army, Cummings began writing. He published many books, plays, and essays. EE Cummings is best known, however, for his poetry. The poetry of EE Cummings has been described as being part of the Imagist movement. He is sometimes compared to Ezra Pound, Hilda Doolittle, William Carlos Williams, Amy Lowell, and modernist Gertrude Stein, and rightfully so. In truth, Cummings is an Imagist, but he’s also a romantic poet. His poems take on the theme of love more often than not. His most famous romantic poem is, of course, [i carry your heart with me (i carry it in]. While he had a gift for language, Cummings also loved the visuals of poetry. EE Cummings liked to play with look of language. His unique and expressive framing of lines of verse, or even individual words, appealed to his readers. An example of this is the poem I Have Found What You Are Like . Another perfect example of his almost maddening style is found in the poem I Will Be. The genius of EE Cummings is evident in his written and visual expressions. I don’t want this to turn into a biography of the man, but if you enjoy the written word, if (to paraphrase Maya Angelou) you love the look of words, I can’t recommend this tome highly enough. EE Cummings was the unique voice in a time full of unique voices. 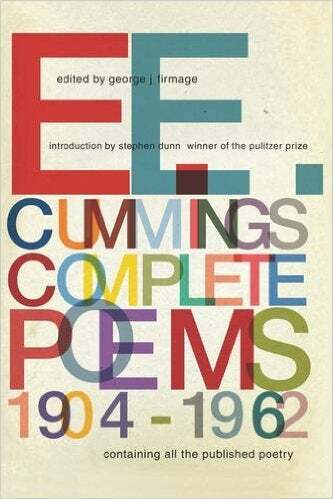 His approach to poetry transcends time, and the best way to experience it is to purchase ee cummings: Complete Poems, 1904-1962. You will be happy that you did.